Why Should We Learn Calligraphy? 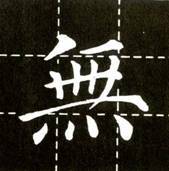 Calligraphy was regarded by Confucius as one of the “six arts,” being the skills and techniques ancient gentlemen must possess. As people in ancient times regarded studying, understanding characters and writing as equals, calligraphy was no longer purely a technique but equivalent to scholarly cultivation. As such, Chinese has stressed calligraphy for long, regarding it as a medium of holding the formal doctrine, the outfit for essays and external expression of an individual’s cultivation. Since the introduction of the metropolitan officials system, calligraphy by the scholars was particularly emphasized. 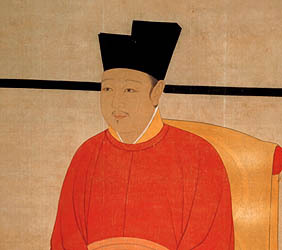 In the Tang dynasty, it was even made public that officials were recruited according to candidates’ “body, speech, calligraphy and argument.” This culture of recruiting an official by evaluating candidates’ calligraphy reached its prime in the Ming and Qing dynasties when “Guangeti” calligraphy exclusive for use in the Academy appeared. No wonder the famous officials in Chinese history were all well-learned scholars. Their excellence in calligraphy is related to the Chinese tradition of “rank and fame follow excellence in scholarship” and “calligraphy for rank and fame while painting for benefits and wealth.” During the course of the history of China, emperors and well-known officials, for example, Emperor Tai-zhong of the Tang dynasty, Emperor Hui-zhong of the Song dynasty, Emperor Qianlong, and Li Si of the reign of the First Emperor of Qin, Chu Sui-liang of the reign of Tai-zhong of the Tang dynasty, Su Si and Huang Tin-jian of the Song dynasty and Liu Yong and Lin Zexu of the Qing dynasty and even the treacherous ministers in Chinese history like Qin Hui, Cai Jin, Yen Song, etc were first-rate calligraphers. Do modern people still need to learn calligraphy? We always say that learning calligraphy can refine one’s temperament. But which aspect of one’s temperament is refined? Indeed, through copying model calligraphy, we can become a person of strong observance, intricate mind, subtlety and responsibility. 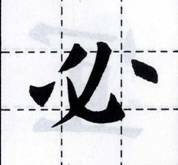 Could you read the direction of the brush of the Chinese characters of “bi必” and “wu無” above? The dots and brushes in calligraphy follow the flow of a certain direction. During our process of copying model calligraphy, we should firstly observe the characters in detail, find from each character 1. the key brush 2. the length and thickness of dot and brush, and 3. the relation of coherence and concession between them, followed by further evaluation of 4. the feature of composition of each character. When the above are clearly imprinted in the hearts of the calligrapher, he can put his brush down from copying the model calligraphy. A work appearing simple indeed requires practical and minute work, which cannot be handled by a careless and ill-tempered person. Moreover, if we wish to improve our calligraphy, perseverance in practicing copying cannot be avoided so that copying becomes a daily practice. Through perseverance, we not only improve our calligraphy, we will also become a serious and responsible person.